Fig. 40 Idealized HDA showing electrons with energies 1000 eV (red), 900 eV (green), and 1100 eV (blue). Fig. 41 2D cross-section of previous figure. Fig. 42 Potential energy (PE) view of previous figure. The Hemispherical Deflection Analyzer (HDA) consists of two concentric hemispherical electrodes held at different potentials. Charged particles of only a certain kinetic energy (KE), called the pass energy, can pass through the electrodes, and particles at energies sufficiently lower or higher will hit the walls or apertures, so the system acts as a narrow band KE filter. A picture of a SIMION simulation of an HDA is shown in Figures 1-3. This HDA allows through electrons with energies between roughly 900 and 1100 eV. The HDA also has a focusing effect: 1000 eV electrons (red) focused at the top entrance regain focus at the bottom entrance. The pass energy at is , for particle charge . 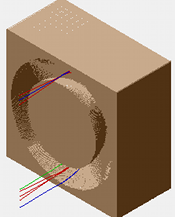 Typical GEM files for sperical capacitors are given below. Here, = -200000, = -2000, = 100, = 1000 eV, and = 0. The inner and outer radii are = 80 mm and = 120 mm. Optionally surface=fractional may be replaced with surface=auto in >= 8.1.1.25, but that is less accurate (see surface=auto option in pa_define [8.1.1.25]). If creating a PA# file, you may replace the two voltages with 1 and 2 to permit fast adjusting. The 3D GEM file consumes a lot more RAM than the 2D version, but if you need to add any feature to this geometry that breaks the 2D symmetry (e.g. entrance/exit slits), you likely will need the 3D form. If you omit the “x” mirroring in the pa_define statement, then an idealized HDA will be represented (i.e. just one half of the sphere). The boundary condition for potentials on the x=0 plane is assumed by SIMION to be approximately a Neumann condition (derivative of potential along normal to the x=0 plane equal to zero), which is the same condition that exists in the spherical capacitor. In theory, an idealized HDA could be constructed by covering the X=0 plane with an ideal (100% transmission) grid that has a variable potential over its surface exactly matching Equation (1). In practice, such a grid can only be approximated (e.g. with a series of thin wires), and some fringing fields will always exist near this X=0 plane. To model a real HDA with fringe fields, you would include in your potential array the space and electrodes surrounding the entrace/exit (like in the SIMION Example: hda – Figure 4). Fig. 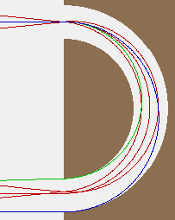 43 SIMION “hda” example (Zouros), run at higher mesh resolution and displayed with cross section cut-out. See Electrode Surface Enhancement / Fractional Grid Units for a way to improve electric field calculation accuracy by more than an order of magnitude. SIMION Example: surface_enhancement (SIMION 8.1.1.10) demonstrates this for an HDA. T.J.M. Zouros, Omer Sise, F.M. Spiegelhalder, and David J. Manura. “Investigation of the accuracy of ion optics simulations using Kepler orbits in a spherical capacitor.” International Journal of Mass Spectrometry. 2006. doi:10.1016/j.ijms.2006.08.005 Note: the SIMION 8.1.1 Electrode Surface Enhancement / Fractional Grid Units feature (demonstrated for an HDA in SIMION Example: surface_enhancement) greatly improves accuracy beyond the results in this paper. DoganUlu2013. Dogan, M.; Ulu, M.; Gennarakis, G. G.; Zouros, T. J. M. Experimental energy resolution of a paracentric hemispherical deflector analyzer for different entry positions and bias. Review of Scientific Instruments, volume 84, issue 4, year 2013, pages 043105. doi:10.1063/1.4798592 – energy resolution of a paracentric HDA, evaluated with experiment and simulation (SIMION 8.1.1 surface enhancement with many run parameterizations). DoukasMadesis2015. Doukas, S.; Madesis, I.; Dimitriou, A.; Laoutaris, A.; Zouros, T. J. M.; Benis, E. P. Determination of the solid angle and response function of a hemispherical spectrograph with injection lens for Auger electrons emitted from long lived projectile states. Review of Scientific Instruments. volume 86, issue 4, year 2015, pages 043111. doi:10.1063/1.4917274 [see also poster] – “In this report, we have shown how a Monte Carlo type approach can be combined with SIMION to accurately simulate a high resolution projectile Auger electron spectrum recorded by a hemispherical spectrograph with injection lens and 2D position sensitive detector.” “…at each point of the ionic trajectory z, a number of emitted electrons is determined proportional to the product of the decay term and the solid angle term in Eq. (19) as illustrated in Fig. 4 and then multiplied by a starting indicative number Ni that determines the total number of electrons to be flown.” Uses SIMION simulations. SiseZouros2015. Sise, Omer; Zouros, Theo J. M. Position, Energy, and Transit Time Distributions in a Hemispherical Deflector Analyzer with Position Sensitive Detector. Journal of Spectroscopy. volume 2015, year 2015, pages 1-20. doi:10.1155/2015/153513. – “Here, we have explored for the first time the time-offlight properties of the biased paracentric HDA for the two special entry positions already investigated in the past as to their energy resolution and compared them to those of the conventional HDA…” Uses SIMION simulations. BenisMadesis2018. Benis, E.P. Madesis, I. Laoutaris, A. Nanos, S. Zouros, T.J.M. Experimental determination of the effective solid angle of long-lived projectile states in zero-degree Auger projectile spectroscopy. Journal of Electron Spectroscopy and Related Phenomena. volume 222, year 2018, pages 31-39. doi:10.1016/j.elspec.2017.10.001. “Advances in Imaging and Electron Optics: Electron Physics: Optics of Charged Particle, Volume 157” by Mikhail Yavor has a chapter on many types of energy analyzers, including HDA’s, with SIMION screenshots. This chapter is also available at doi:10.1016/S1076-5670(09)01606-1 . The voltage optimization of a four-element lens used on a hemispherical spectrograph with virtual entry for highest energy resolution O. Sise, G. Martínez, I. Madesis, A. Laoutaris, A. Dimitriou, M. Fernández-Martín, T.J.M. Zouros. 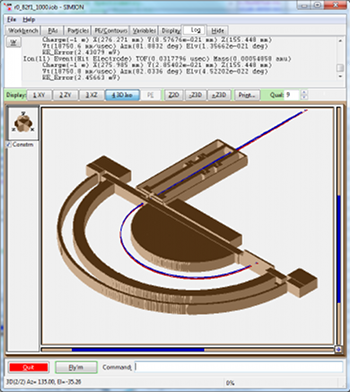 – four-element lens optimization with hemispherical deflector analyzer (HDA) and PSD detector, with SIMION FDM as well as BEM following by experimental confirmation.